Of all the experiences a person has in 40 years of life, I wonder why a walk on the Cedar Bog Trail in Manitoba’s Bird’s Hill Provincial Park 18 years ago still sits in my mind.The sensation of walking froma hot, humid Manitoba summer day into a dark, cool forest of cedars left its mark deep inside me. A month ago, after arriving in Winnipeg after a 13 hour drive and an evening of catching up with friends, our conversation shifted to how we were going to spend our time together over the course of our spring break visit.First up: the Cedar Bog Trail.It was calling me back. The trail starts in aspen poplar forest, shifts to oak trees, then descends to boggy land full of cedar.The change in temperature was startling on a hot early spring day as we moved from the new sun on our bodies into cold and ice in the shade.The shock of cold – so quickly forgotten after a few warm spring days – reminded me of how quickly we acclimatize to new circumstances.I was also reminded of how the world sends us constant reminders of past circumstances, and how the past, the present and future are constantly being juggled. In the bog, to make it passable, logs have been laid perpendicular to the path – a corduroy road.The quality of the corduroy is aged and suspect at this stage in the path’s life. Frozen, our passage was unhindered; thawed, our passage would have been arduous and messy since the corduroy logs themselves are now few and far between.I was thankful that the path was frozen. Just before we left the bog, we came across an area that was a large expanse of ice.In a few days the passage would be completely underwater.We “skated” on the ice, avoiding the ends of a couple of corduroy logs poking out of the ice and bog. Then we made our way out of the bog, back to the oak and aspen forests and back to Winnipeg, andeventuallyback to Edmonton.And the ends of old corduroy logs keep poking at me, prodding me to further make sense of the Cedar Bog Trail. 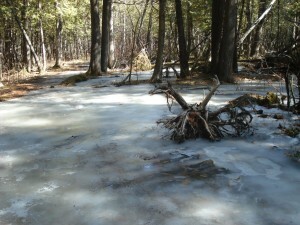 When the ice melts there will not be enough logs for the trail to be easily passable.I can see this clearly through the ice.People will be bogged down. It is passable right now!Just skate over it. Deal with the problem later. Can and should it be solved now? Is it my problem to solve? How can I equip myself appropriately? Does this path need to be well tended? Do all paths need to be well tended? Even when I think I have left the old corduroy road behind, it keeps popping back up. In this trail, it pops up in my memory everytime I explore a forest.And in the road at our family place at the lake, pieces of the 90 year old corduroy road keep popping back up through decades of gravel and tar. The Cedar Bog trail in Birds Hill Park is a special place indeed! I have encountered similar corduroy remnants, active or not, on canoe portages and other muddy locations. It is at once something to make one harken back to an earlier time when simple solutions were hewn from the nearby woods, and appreciate its current utility.